Original Fragrances and Cosmetics, Skin Care, Footwear, Appliances, ETC. Location Map, click HERE. Check the website for the pricelist too! Cathay Pacific and Hong Kong Disneyland present "BUY 2 GET 1 FREE!" Vacation Packages! From now to 19 December 2009, Cathay Pacific is offering "BUY 2 GET 1 FREE" Hong Kong Disneyland Travel Packages with an array of value-added benefits. Experience the magic at Hong Kong Disneyland throughout the year! From 20 November onward, live your Christmas dream as Sparkling Christmas at Hong Kong Disneyland transforms into a Winter Wonderland. Delight in the wintery fun of Main Street U.S.A. as you take in the breathtaking Christmas decorations, glistening lights and falling snow. Feel the beat of the Let It Snow Christmas Parade or set sail to a whole new world in Fantasyland, with "it's a small world christmas". As night falls, be dazzled by the all new Lights of Winter, a magnificent illumination of Christmas lights. Sparkling Christmas Winter Wonderland is sure to set your hearts aglow. Don't miss out! Book your package today through Cathay Pacific Reservations at - Manila (632) 757 0888 or Cebu (6332) 231 3747 or your travel agent. For more details about "Disney's Sparkling Christmas", please visit www.hongkongdisneyland.com. To know more about this promo, visit Cathay Pacific Philippines or simply click here! Toytown-The Biggest ToyOutlet Store of The Season!!! 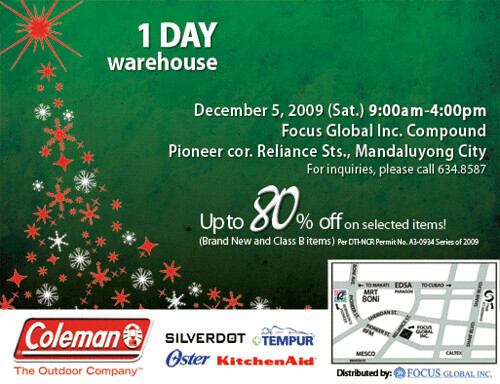 Get as much as 70% Discount from November 12, 2009 to January 15, 2010!!! 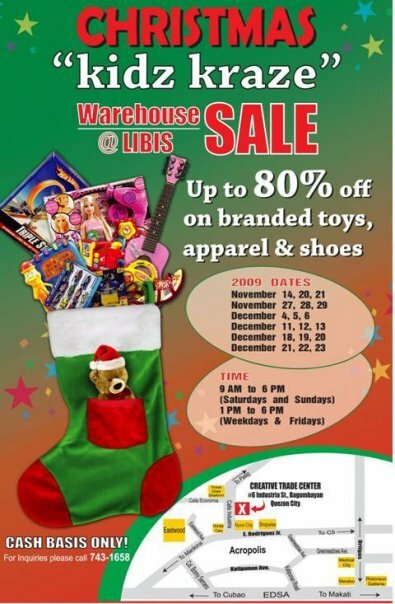 Warehouse SALE @ Libis Enjoy up to 80% off on branded toys, apparel & shoes!!! 'Tis the season for early Christmas shopping! Grab holiday discounts of up to 70% at the Market! Market! Pre-Christmas Sale! Sale! Purchase items P1,000 and up and get a chance to Pick-A-Prize! Premium Oakley items; Fitness First's facial, work out and membership gift certificates; and Dora the Explorer Blow Bubbles. 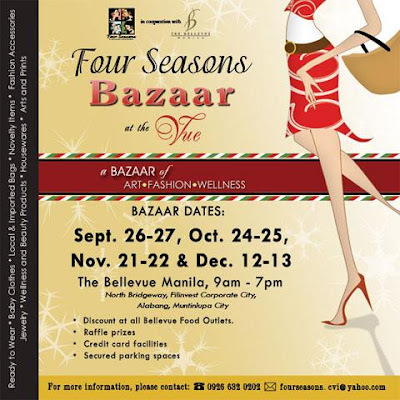 Visit the concierge desk for more details or visit http://www.myayalamalls.com/ for more information! Valid from 01 to 31 December 2009 for Outbound travel. Return travel should be between 01 to 31 January 2010. To celebrate the arrival of our newest aircraft we will be offering a special promo for a limited time only. For travel from 01 to 25 December 2009 and 01 February to 15 March 2010. For flights from Los Angeles, San Francisco and Las Vegas to Manila. Valid for sale through the internet only. For travel on or before 27 November 2009 and between 30 December 2009 and 15 March 2010. For flights from Los Angeles, San Francisco and Las Vegas to Manila. For travel between 12 January and 30 April 2010. Book and buy now to avail of the lowest fare. 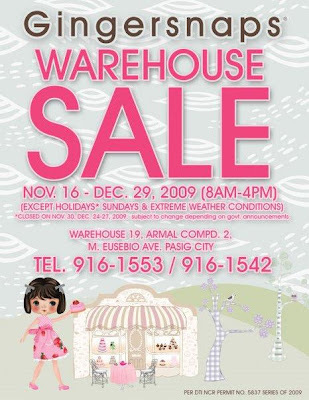 For sales until 30 November 2009. Travel Now, Pay Later with UnionBank's offer to Philippine Airlines customers. Promo period until 31 December 2009. Visit your relatives and friends this coming holiday season. Check out our lowest fares. Pack your bags and fly off to Los Angeles or San Franciso. Visit http://boracaytropics.com/ for more information! 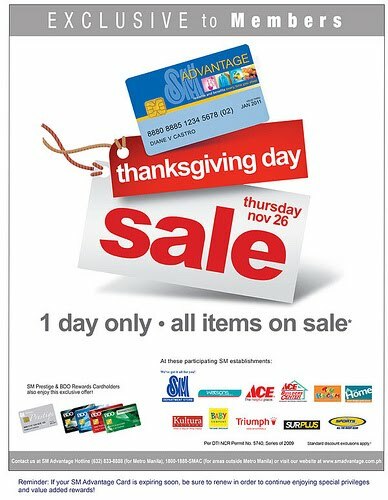 Holiday goodwill starts at VMV's THANK YOU sale! All VMV Products and VxServices yours up to 70% OFF. TO ALL BAZAAR-FANATIC ESPECIALLY DURING THE HOLIDAY SEASON, HERE'S A LIST OF WHAT I HAVE GATHERED SO FAR! ENJOY SHOPPING!!! November 1 to 30, 10 a.m. to 9 p.m.
November 6 to 8, 13 to 15, 20 to 22, 27 to 29. December 4 to 6, 11 to 13, 18 to 20, 25 to 27. Rockwell Tent, Makati City, 11:30 a.m. – 10 p.m. Enjoy great bargains from the best beauty and fashion brands like Kira Plastinina, Fox, Lyn, Adidas, Ray-Ban, Iora, Giordano Ladies, Lei’s Closet, Ray-Ban, The Face Shop, and more. Exclusive Perks for Metrobank Cardholders: free entrance to the bazaar, raffle entry, free drinks and free photo at the picture booth. November 11 to 13, 25 to 27, 9 a.m. to 7 p.m.
November 13 to 15, 28 to 30, 10 a.m. to 9 p.m.
November 13 to January 10, 10 a.m. to 9 p.m. Weekends starting November 14-29, 9 a.m. to 6 p.m.
November 14 to January 11, 10 a.m. to 9 p.m.
November 28 to 29, 10 a.m. to 10 p.m.
November 25 to 30, 10 a.m. to 9 p.m.
November 27 to 29, 10 a.m. to 9 p.m.
November 28 to 29, 9 a.m. to 8 p.m. When: November 21-22 and December 12-13, 2009 9am to 7pm. When: December 5, 2009 (Sat.) from 9am to 4pm. Where: Focus Global Compound along Reliance St. cor. Pioneer St. Mandaluyong City. appliances, Tempur pillows, Silverdot bathroom scales and KitchenAid mixers. Visit http://www.abenson.com.ph for more info. Daniel Hechter, Jacques Farel, Momo Design, Roots, Adidas, Folli Follie, Disney, Cherie Paris, Techos, Barbie, Superman, Batman, Hello Kitty.